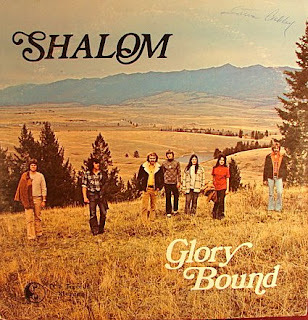 Glory Bound (Rose City Sound RCS 73421) 1973? This Oregon co-ed group’s debut has some nice soft folk to MOR sounds – a mellow electric style featuring smooth male/female harmonies backed by the basics of piano, acoustic and electric guitars, bass and drums. Includes welcome renderings of ‘Two Hands’ and ‘Teach Your Children’. The best is saved for last though as the album closes with three lovely fragile moody ballads ala Children Of The Day: ‘I Had A Dream’ (with soothing wah-wah guitar), ‘Standing In The Rain’ (with rain effects) and ‘He’s Listening’. 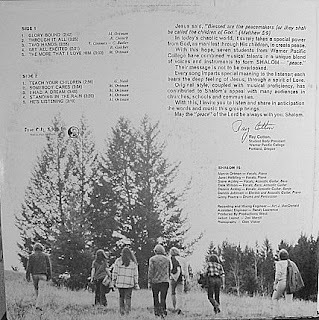 Two covers exist: the original has illustrations of the members’ faces while the later press has a photo of the group out in a field. All seven of these folks were students at Warner Pacific College. (Ken Scott – The Archivist). You can also write a letter to this personnalities! I saw Shalom perform back in 1974. It was in Phoenix or San Jose. I have a signed copy of the original pressing with the illustrated cover. You might want to listen to the last track “He’s Listening” as it is quite distorted. This comment is not meant to be a complaint but I only mention it because that particular song has some beautiful harmonizations.